The Institute of Physics' website, physicsworld.com, has chosen, How the Hippies Saved Physics: Science, Counterculture and the Quantum Revival, a book about a group of physicists in California who brought quantum physics to the forefront of mainstream science. The book by associate professor at the Massachusetts Institute of Technology, David Kaiser, looks at the these new age thinking scientists who called themselves the “Fundamental Fysiks Group” and how they influenced modern physics to focus on the weird world of quantum theory. Physics World's editor, Matin Durrani, and reviews editor, Margaret Harris help choose 2012's Book of the Year based on factors such as its relevance to science (with emphasis on physics), readability, how well the book is written, it's originality, and scientifically interesting. David Kaiser was asked why he wrote the book. He says, "I've been interested for a long time in the fortunes of physics as a discipline over they years since World War 2. The physics that came out of the war in a whole new orientation, a whole new place compared to how it ever been..."
Kaiser continues, "There was a temporal boundedness to that kind of post WW2 era of big enrollments tremendous funding, of almost glamour especially in the US to the physics profession. And that came tumbling down horribly quickly around the early 1970s. So I was interested to how is it like to be a young physicist as assumptions about the field were changing so rapidly. What was it like to be a young physicist in 1975 versus 1955 and so I was curious to that larger question. I stumbled on this group. I've been interested to Bell's theorem since I was a physics student. I knew about John Klauser's wonderful early experiment that I learned about later on. I've read books like the Tau of Physics by Fritjof Capra as an interested high school kid. I didn't know they were all related..."
Margaret says the book is a fun and interesting read and that It's been a front runner for book of the year since was reviewed by Physics World on August 2012. 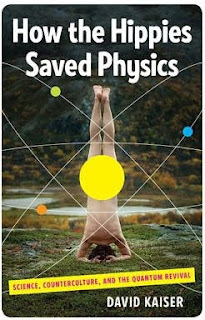 Even half of Physic's World facebook followers have voted for the book. The Science Magpie - Collection of trivia, humor and stories about science. A Hole at the Bottom of the Sea: The Race to Kill the BP Oil Gusher - Story about the BP oil spill. It shows how scientists, engineers, physicists, and geologists figure out how to close the well. Life's Ratchet: How Molecular Machines Extract Order from Chaos - A detailed book about biophysics. The Geek Manifesto: Why Science Matters - A book about how science should have a bigger role in public life.